Why choose between solar and coal when you can use both? Global Energy Production will increase dramatically by 2035, regardless of energy-efficiency improvements in developed economies. 1.5 billion people have no access to electricity, and 85% of the population in Africa don't yet have electricity. There is enormous unmet demand for access to electricity and clean energy. Consider a region perhaps in China or India that has a 600 Megawatt coal-fired power station, and it wants to double this generating capacity. What do some of the options look like and how do they compare on cost and carbon dioxide emissions? One option is to build another 600 Megawatt coal-fired power station. Another option is to build a 600 Megawatt concentrated solar thermal power station with sufficient thermal energy storage to allow it to operate reliably overnight and after one or two cloudy days. A further option is to replace the existing 600 Megawatt coal-fired power station with a 1200 Megawatt combined-cycle gas turbine (CCGT) power station, and optionally generate the fuel for this power station using the coal supply from the existing 600 Megawatt coal-fired power station with a much smaller concentrated solar thermal (CST) field of heliostats. For option 1, the coal supply has to be doubled, and CO2 emissions also double. CO2 emissions intensity is constant at 0.8 tonnes per Megawatt-hour. For option 2, a very large and costly field of heliostats is needed. 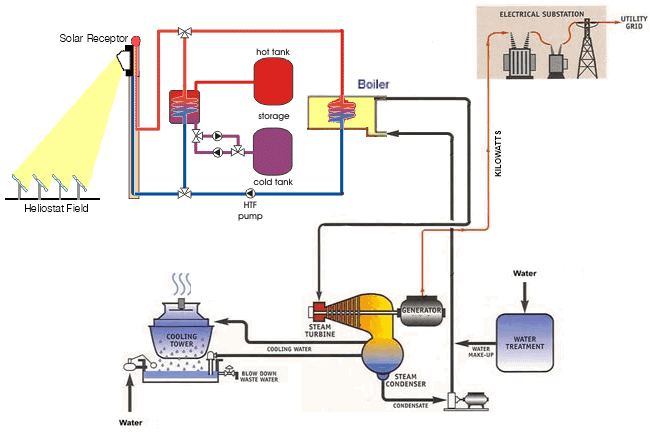 The thermal energy storage system for reliable operation overnight and after one or two cloudy days is a substantial proportion of the total cost, and even then does not provide reliable operation in periods of extended cloud cover. CO2 emissions remain constant, because the existing coal-fired power station continues operation as before. CO2 emissions intensity of the combined existing and new systems is halved to 0.4 tonnes per Megawatt-hour. For option 3, a new combined-cycle gas turbine (CCGT) power station is needed, and the existing coal-fired power station is decommissioned. The coal supply from the decommissioned power station is converted to Syngas using a much smaller field of heliostats. Some components of the decommissioned coal power station, such as the coal-handling equipment may be re-used. 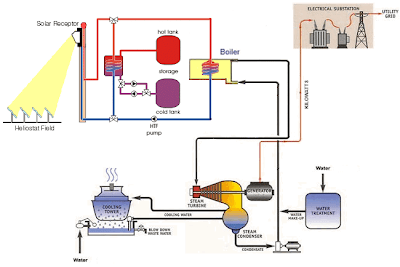 No thermal energy storage system is required: this need is met by storing Syngas for continuous power generation. CO2 emissions remain constant: the new power station is consuming the same quantity of coal as the existing coal power station it replaces. However it produces twice the amount of electrical energy so the CO2 emissions intensity is halved to 0.4 tonnes per Megawatt-hour. 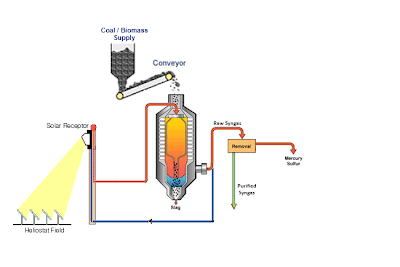 Note that the solar thermal gasification of coal in this option provides the same benefit as a Carbon Capture and Storage system that removes 50 percent of the CO2 emissions of a coal-fired power station. Note: Option 3 achieves the same outcomes as option 2. That is, total electricity output capacity is doubled to 1200 Megawatts, CO2 emissions do not increase, no additional fossil fuel is needed, and CO2 emissions intensity is halved to 0.4 tonnes per Megawatt-hour. The choice between options 2 and 3 can be based on a comparison of their cost and a consideration of the added benefits of option 3. 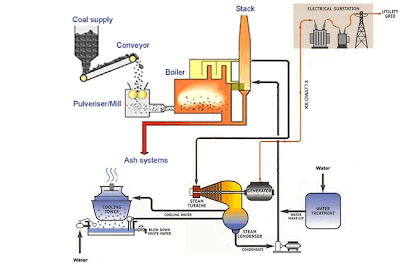 The coal industry wastes time and money researching inefficient power generation. - and is trying to forget an established technology in use throughout the world. This technology results in fewer toxic emissions, less CO2 emissions, the ability to use cheaper coal and more efficient power generation. The "problem" is that LESS coal is needed to produce the same amount of power. The coal industry is now trying to stop the use of low-cost coal and cheaper, cleaner energy from coal. This post describes one such effort: Latest Buzz... Coal leads EPA regulations - and then opposes them. 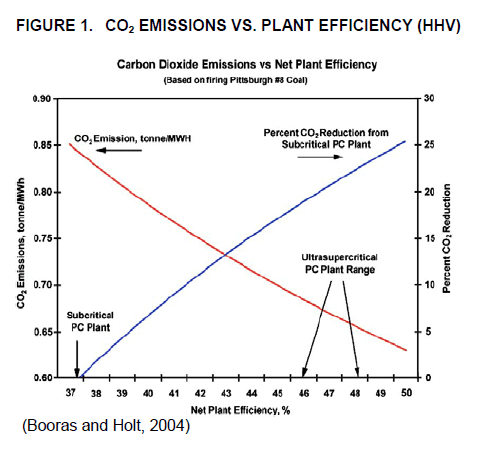 Increased efficiency of power generation is the most predictable and cost effective method for CO2 emissions reduction. In an existing coal-based plant without CCS, increased efficiency is the only practical method for mitigating CO2 emissions now, and it will be important for future plants equipped with CCS in order to reduce the energy impacts and costs of CO2 capture. 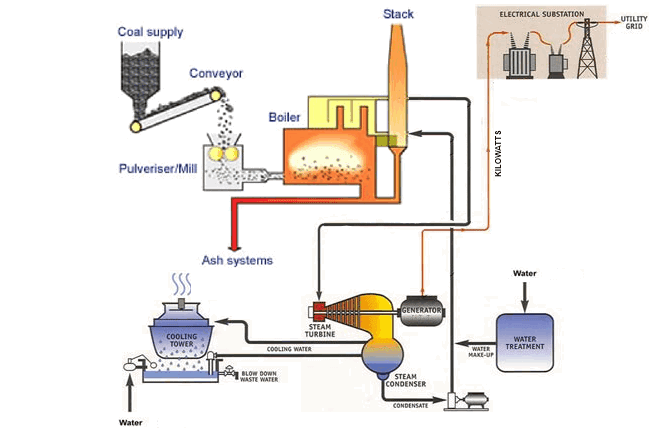 Gasification-based technologies convert coal to a synthesis gas (syngas) consisting mainly of CO and H2.The syngas is cleaned to remove contaminants before it is used as a fuel in a gas turbine. 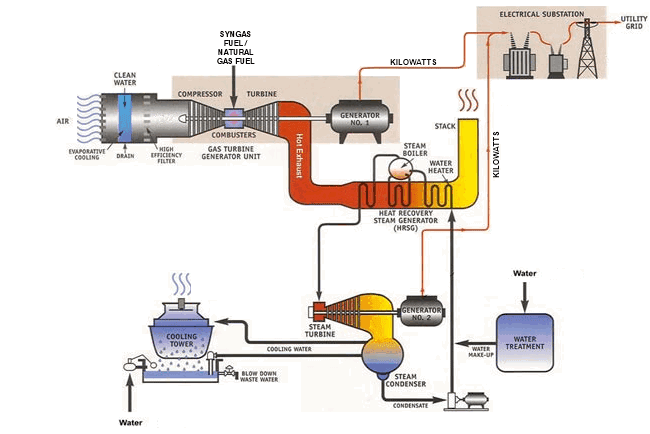 The hot exhaust gas from the gas turbine is used to produce steam in a heat recovery steam generator for a steam turbine-electric generator. This combination of a gas turbine and steam turbine cycles is called combined cycle power generation. Integrating the coal gasification and combined cycle technologies, IGCC provides the benefits of using low-cost coal with the high efficiency of combined cycle power generation. Higher efficiency results in lower emissions per unit of electricity generated. IGCC technology is being demonstrated in two plants in the U.S., two in Europe, and one in Japan. Industry standard designs are based on the use of eastern bituminous coal, although IGCC plants can be designed for a wide range of coals. CO2 emissions fall as efficiency increases. A good proposal by the Government to bring those energy prices down? Well, this is a government which has presided over a massive increase in prices. Power prices are up 89 per cent since Kevin Rudd became Prime Minister and the carbon tax is now making a bad situation worse. I think if the Government was serious about bringing prices down, it wouldn't be lecturing the States about what they might do. It would be doing what it could do and that is getting rid of the carbon tax and that would instantly, on the Government's own figures, reduce prices by 10 per cent. 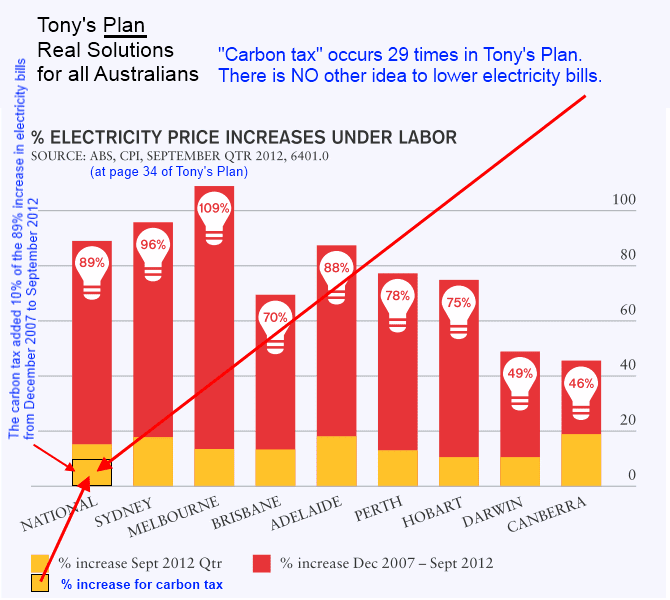 But the truth is that the carbon tax is only contributing a small amount to those price rises. It's only been in since July 1 and for these proposals that the Government is putting forward to work, it does need cooperation from state governments to deregulate power prices. Now, Queensland Premier Campbell Newman has already said no. We're getting similar indications from the NSW Coalition Government. Is that because it's actually politically convenient to keep those prices high leading up to the Federal election and just keep blaming it on the carbon tax? No one wants to see prices high. Everyone wants to see prices down. But the most practical thing the Commonwealth could do right now to get power prices down is to take off the carbon tax and, you know, the whole point of the carbon tax, Lisa, is to raise power prices. The point I keep making is every time your power bill goes up, the Prime Minister has a smile on her face because that is the carbon tax just doing its job. Alright. Well, you've already promised that, should you be elected Prime Minister, you will get rid of that carbon tax. That leaves you 79 per cent of those price rises you've got to play with. Can you guarantee that an Abbott government will bring energy prices down beyond taking off the carbon tax? Well, that's a very, very good start. That is a very good start and we would have the ACCC out there making sure that businesses did not profiteer once the carbon tax was off. Ok, but you still haven't answered my question. How much will you bring down energy prices beyond taking off the carbon tax? You're still not answering my question, Mr Abbott. But, Lisa, I'm saying there will be no carbon tax under a government I lead and when I say that, I'm telling the truth. So should I get from that that you don't actually have a plan on how to bring prices down beyond the carbon tax, beyond getting rid of the carbon tax, Mr Abbott? That's a very, very good start, Lisa. 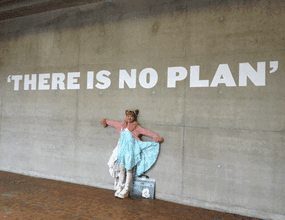 Ok, well, I'll have to take it that you don't have a plan. Unless you're going to put one forward, it doesn't look like you've got a plan, Mr Abbott. Lisa, the plan starts with getting rid of the carbon tax. Anything special about 124.334 MeV binding energy? Why does 8.557 MeV binding energy occur in these 2 places? What can exploding stars tell us about soil moisture? The cosmic-ray probe is a emerging technique for the continuous monitoring of soil moisture at scales in the order of 40ha. The cosmic-ray probe counts fast neutrons that are produced as cosmic rays from exploding stars interact with the earth's atmosphere and soil. This presentation by CSIRO's Dr David McJannet will provide a basic introduction to the cosmic-ray soil moisture probe and how it works. Enquiries: peter.hairsine@csiro.au or 02 6201 9462.